This post is my fifth and final in a series on DENIAL. I’ve written about how we intellectualize (https://julietvanheerden.wordpress.com/2014/09/17/stepping-out-of-denial/), how we minimize and avoid in order to deny our truth (https://julietvanheerden.wordpress.com/2014/09/21/denial-baby-denial/), and how we blame others, rather than take responsibility for our situation (https://julietvanheerden.wordpress.com/2014/10/01/yoga-pants-you-are-not-my-bff/). I’ve invited you to join me in unveiling the mirror of truth, and taking the first of 12 Steps: Admitting our powerlessness over our compulsions, obsessions and addictions, and that (in some area) our lives have become unmanageable. Having done so, perhaps we are finally ready come all the way out of denial and move on to Step 2. We’ll do that next time. For now, we have one more area of denial that hasn’t been addressed. Today’s post takes a different slant. It’s written for those of us who have loved or lived with someone whose denial is destroying them. We’ve witnessed the up-close-and-personal ugliness of addiction – in our spouse, our child, a parent, or a friend. If we’ve tried to intervene, we may have been on the receiving end of their hostility. 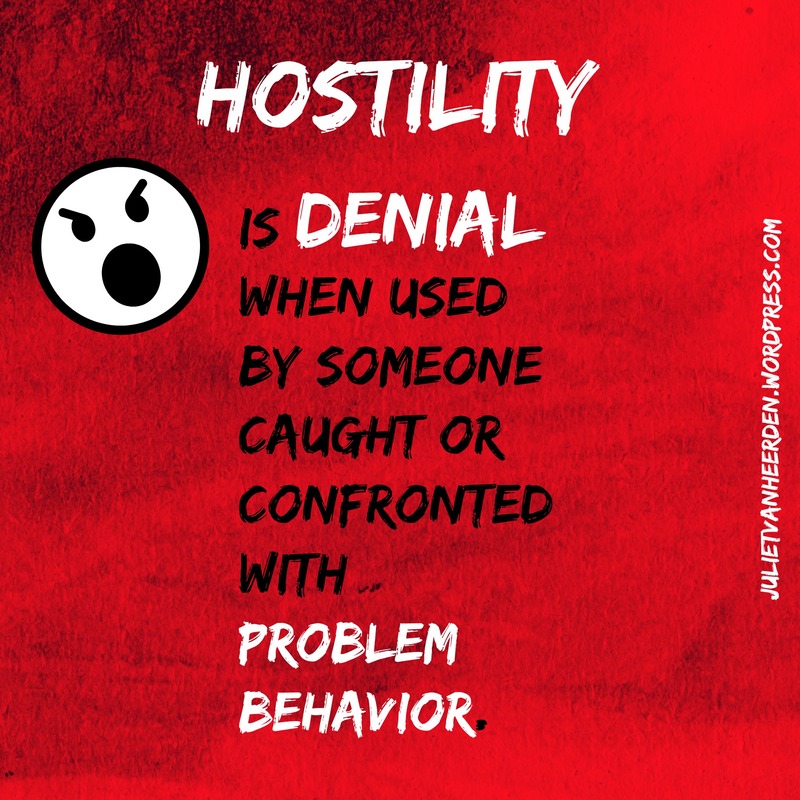 Hostility is denial when used by someone caught or confronted with problem behavior. It manifests as anger, lack of communication, or verbal and physical abuse (adapted from the “What is Abuse” session of the Door of Hope http://www.careforcelifekeys.org/pages.asp?id=53). Denial is considered the “hallmark of addiction.” It runs rampant in chemically and co-dependent families. Darlene Lancer, MFT says, “Children of addicts often deny that their parents’ problems affect them, believing that leaving home, or the addict parent’s recovery put an end to their problems. They don’t realize that they’re still affected, nor [do they] think about their painful childhood. Even if they only had an alcoholic grandparent, this made their parent codependent, and as a result they’ve been affected as well” (Codependency for Dummies p. 65). I’d like to extend what Ms. Lancer says to include parents and spouses who pretend that they are not affected by the self-destructive choices their kids and lovers make. We pull our heads into our self-protective turtle shells and close the door when we get “snapped at” by someone who is hiding behind a wall of hostility. If you’re like me, even a little snap inflicts emotional pain. Sometimes we snap back. Other times, we retreat and allow the person to continue their destructive behavior unchecked. I remember trying to figure out how to broach the subject of my former spouse’s obvious relapse after several months of “clean” living after his release from a live-in treatment facility. He wasn’t volunteering any information, but the “red flags” the addiction specialist had warned me to watch for all waved vigorously. I wanted to catch him in the act, or in a lie, or with some kind of hard evidence because I knew that he would be hostile towards me and manipulate his way out of the confrontation if I had nothing concrete. For weeks we played cat and mouse. I tried to trap him, but he weaseled out of every accusation. I remember calling my sister to tell her what I’d seen, begging her to write down what I said because I was sure that he would get me to believe something different. I didn’t even trust my own sober senses. I needed a witness to my life so that I would know I wasn’t crazy. Have you been there? Denial sometimes causes people to express negativity or aggression in indirect and passive ways. While the addicted person denies his/her problem, responsibility, or behavior, and deflects intervention with hostility, we can respond with hostility of our own – getting caught in a firestorm over dirty clothes, unpaid bills, or other minor issues, while denying the deep emotional or physical devastation of their addiction. What can we do? Living in a hostile environment eventually takes a toll on every aspect of our lives. Watching our loved ones destroy themselves is traumatic. Admitting that we have no control over their hostility and denial is our crucial First Step. Finding a safe place to express ourselves and be heard when our loved one cannot hear us is also vital. There are safe places. Al-Anon is one of them. Yes, it’s for family members of alcoholics, but is also beneficial for anyone who loves an addicted person. If you’d like a sample of the type of community Al-Anon is, here’s a seven-minute podcast: http://al-anonfamilygroups.org/TheSteps/using-step-one. If you find yourself consistently meeting hostility with hostility (either passively or aggressively) in your own home, it’s time to get help. May I encourage you to find a group like Al-Anon, Celebrate Recovery, or Codependents Anonymous? Yes, you have Jesus. But even He didn’t go it alone. He surrounded Himself with 12 people with whom He shared His life. No, they were not perfect. Yes, one denied and one betrayed Him, but he didn’t isolate Himself. He found hope in community. He was our example. Don’t deny Him the opportunity to work through others to help you in your particular situation. Let Him redeem the things you thought were lost. Let Him begin with you! Thank you for Your example. Thank You for living Your earthly life within a circle of friends with whom You could be authentic. Forgive me for going it alone sometimes. Forgive me for fighting fire with fire when I see those I love making such poor choices. Help me to “speak the truth in love” as You instruct in Ephesians 4:15. Give me the courage to own my disappointment and pain when I’ve taken a back seat in my loved one’s life while their addiction is at the wheel. Show me how to love with my eyes wide open, like you did when Peter denied You. You didn’t turn the other way and pretend it didn’t happen. You didn’t shout at him or guilt him. You looked straight at him and held him accountable for his actions. Later, when he repented, You forgave him. I want to be like You, Jesus. Amen. This entry was posted in Juliet's Blog and tagged Accountability, Al-Anon, Denial, Hostility, Recovery, Step 1 by Juliet. Bookmark the permalink.